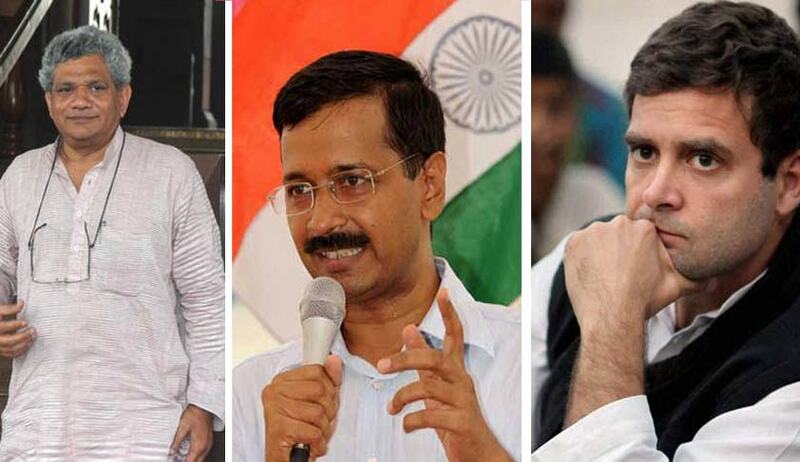 The Cyderabad Police on Sunday registered an FIR for sedition under Section 124A of the Indian Penal Code against nine persons, including Congress Vice President Rahul Gandhi, CPM General Secretary Sitaram Yechury and Delhi chief minister Arvind Kejriwal. Cases have also been registered against CPI MP D Raja, JDU MP KC Tyagi, Congress leaders Ajay Maken and Anand Sharma and, along with Jawaharlal Nehru Students Union President Kanhaiya Kumar and Student Leader Umar Khalid. The Court has posted the matter for hearing on March 4. Sedition is alleged for visiting the JNU campus on February 13 to support and express solidarity to the students who had participated in event against the hanging of Parliament attack convict Afzal Guru. The complaint calls JNU a “hub of anti-national activity” and claims that the politicians are “violating the constitution by supporting the anti-nationals”. The FIR was filed on a complaint filed by Mr. Sunkari Janardhan Goud, after an order was passed by XI Metropolitan Magistrate, Cyberabad, LB Nagar Indira, under Section 156(3) of the Code of Criminal Procedure. An attempt to file a similar FIR was turned down by the Police last week, for want of jurisdiction. Mr. Goud claims to have submitted the video footage aired by Zee News and Times Now, which he says has been authenticated by the Delhi Police. “Since the court has given a directive, we were bound to register the case. The question of jurisdiction is always there as the incidents the complaint speaks of took place in New Delhi. We will take a legal opinion on this and act accordingly. If it is not covered by us, we will transfer this FIR to the concerned police station in New Delhi,” LB Nagar deputy commissioner of police Tafseer Iqubal was quoted as saying. Angered by the argument that Afzal Guru’s hanging was a “judicial hanging”, Mr. Goud was quoted as saying, “This is an insult to the Supreme Court of India as well as the nation. All these political leaders supported the anti-national people who said this, so they also have to be arrested and face trial for sedition. I want citizens all over the country to file such FIRs against them.” He claims to have filed the complaint after his“feelings, patriotism and sentiments were severely hurt” on watching updates on the JNU row on the television.